There is a commercial on television that instead of playing the standard background music has a poetry reading. My husband and daughter find it annoying, yet for me it holds a certain beauty in its cadence. I like the flow of the words, how they fit into each other, each creating a rhythm perfect for the next. I’ve never been big into poetry, mostly because I don’t understand the meaning of what’s being said, but I can close my eyes when it’s read well and enjoy the pulse of sound. I have learned to use this same idea when writing. I am a proofreader as well as a writer by trade. It’s my job to find spelling errors, sentence structure problems, and incorrect punctuation. I can read anything and do this without thinking. Yet when I back up from that task and listen to the movement of the words, it often changes what I think is right. The easiest way to explain this is through writing dialogue. My first task when I approach dialogue is to decide the goal. What is the purpose of the conversation? Next, I ask how each character feels about that goal. Often, the answers create the dialogue on their own. However, when I ultimately start to put it down on the page, I have a semi-systematic method. First, I write the conversation itself, what each character needs to say. Then I return and work on the cadence of it. Cadence, or pacing, does two things. It allows me to share with the reader the characters’ feelings, and it controls the speed at which the scene is read. This is best seen through an example. The scene below contains two characters, a young Irishman named Michael and his friend Patrick. Michael has taken it upon himself to help Patrick’s love life along, and Patrick wants him to know he doesn’t need his help. This is the final cut. You still see the idea of the exchange, but you lose the rhythm behind it. The words become rushed. In order to slow the scene down, I need to add the beats. Now, I could go with the standard “he said/she said,” but that would lose some of the characters’ personalities. “You look perky. You toss around all night?” Michael asked. “Less than you and the child,” Patrick replied. “I’m sorry about that. I don’t know what got into the little fellow,” Michael said. “I suspect he has his father’s lungs,” Patrick said. Boring, huh? And stilted as well. These two are best friends, but you don’t get a picture for that at all. When I initially add beats, I often use brackets to fill in for my final choice of words. My biggest reason for doing this is to avoid repeating myself. There are only so many times you can have a character displaying certain behaviors before they become odd. I remember in one book, the character’s eyes changed color a lot. I began to think they were a chameleon. Notice, I made the brackets the same approximate length as what I wanted the rhythm to be. Now, I don’t always put brackets everywhere like this. Sometimes I know what the character is doing. I knew Michael was laughing. He’s a bit of a tease throughout the story. Patrick is more reserved by nature, so that affects what he will or won’t do. But you get the idea through how I’ve written it. Also, I moved the brackets around. Rather than leaving them all at the end, as in my “he said/she said” example, I broke the thoughts up. The biggest key to writing dialogue is to picture the scene as if it was happening. By doing this, I can usually figure out how the characters move as they speak, if their hands shift or remain still, if their facial expressions change, and that becomes fodder for the pace of the scene. Yet my ultimate aim is always to move this scene into the next smoothly and thereby forward the characters’ goals. Reading is about the pulse of sound, and dialogue is only one facet of that pulse. This same technique works with all other forms of writing. I read and re-read everything to see how its rhythm works, and I change words to fit that rhythm. In the end, striving to give the reader a wonderful experience that makes them want to return and read more of my books. 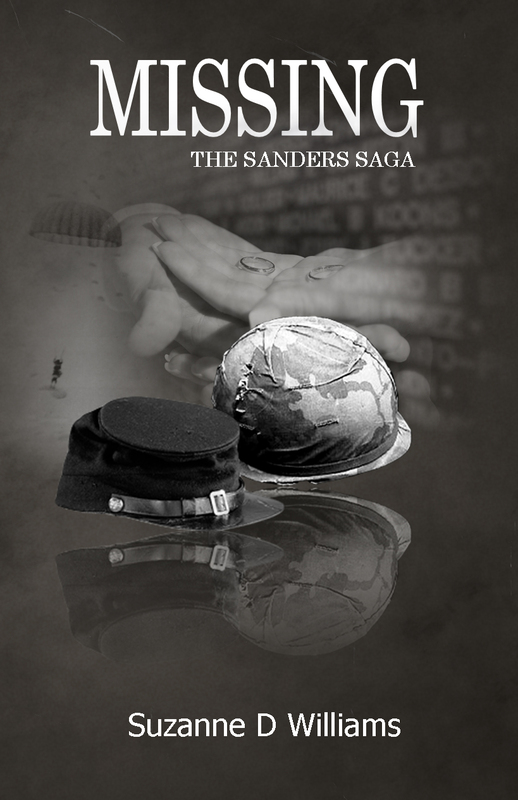 This first book in the Sanders Saga tells the intimate stories of three generations of one family. Adele Davis’ husband, John, is missing in action. A chance encounter with Stephen Sanders, himself also a Vietnam veteran, brings love back into her life. Yet is it right to start over or does that dishonor John’s memory? Amos and Elizabeth Sander sent their sixteen-year-old son, Andrew, off to fight the War Between The States. However, he never returned. In their searching, a strange twist of fate will change their lives and the lives of those around them forever. Molly Pratt has a secret. But then so does Doug Sanders. Will his secret from World War II and her personal tragedy ruin their chance at happiness forever?